Dennis J. Zeisler has been on the faculty of Old Dominion University in Norfolk, Virginia for more than two decades, serving as Director of Bands, Professor of Clarinet and Saxophone, and Chairman of the Music Department. Under his direction, The Old Dominion University Wind Ensemble has developed into a premiere performing ensemble and has received critical acclaim for performances of works by Colgrass, Ring, Sochinski, Camphouse, Hailstork, Smith and Erickson. They have recorded for TRN Music Publishers and Frank Erickson Publications. As Chair for the last twelve years, he has overseen the steady growth of the Old Dominion University Music Department at the undergraduate and graduate level. Professor Zeisler has a B.M., B.M.E., and M.M. from the University of Michigan, where he was solo clarinetist of the Symphony Band under the direction of Dr. William D. Revelli. He was solo clarinetist of the Detroit Concert Band under the direction of Dr. Leonard Smith and clarinet soloist with the United States Military Academy Band at West Point. Mr. Zeisler had his New York debut in Carnegie Recital Hall in May 1974 and has performed at three International Clarinet Society Conferences. He is on the faculty of Blue Lake Fine Arts Camp in Michigan where he is principal clarinetist of the faculty orchestra and conductor of faculty and staff ensembles. 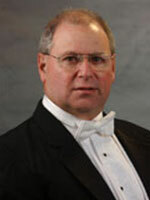 In 1998, Professor Zeisler was awarded membership in the prestigious American Bandmasters Association. In 1999, he received the Orpheus Award from Phi Mu Alpha for “significant and lasting contributions to the cause of Music in America”, and the Virginia Music Educator of the Year Award from the Virginia Music Educators Association. He is founder and conductor of the Virginia Wind Symphony, a professional wind group made up of primarily music educators from throughout the southeastern Virginia area.